Getting a passport in the Philippines is one of the slowest processes. 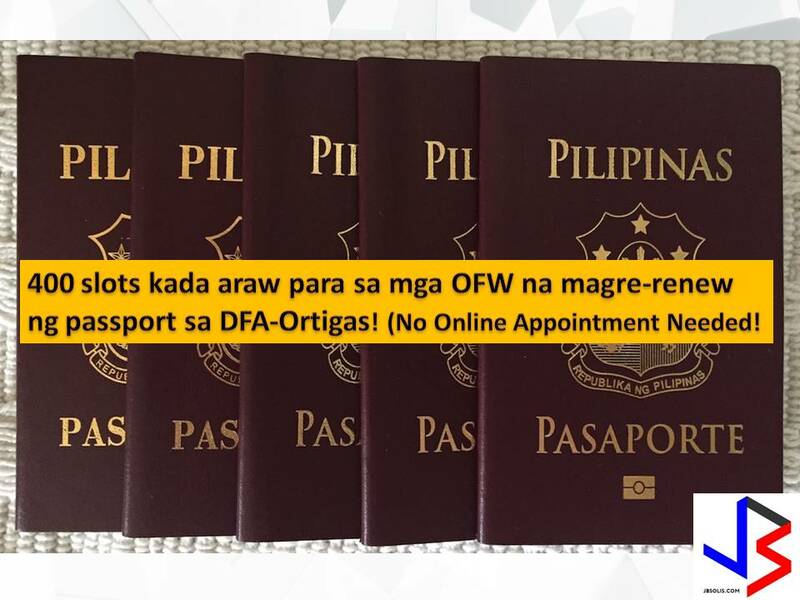 Thousands or even millions of Filipinos want to have a passport but cannot be accommodated even in online appointment since it is always fully booked. But the Department of Foreign Affairs (DFA) is doing its best to shorten the process, especially for the Overseas Filipino Workers (OFW) who are considered to be "Modern Day Heroes" of the country as their remittances keep our economy afloat. If you are OFW who needs to renew a passport, don't your know that online appointment slot is no longer needed in DFA-Ortigas? 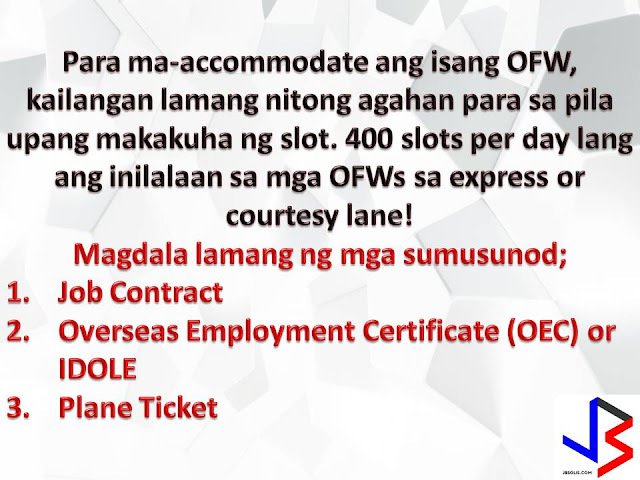 This is after the DFA establish an express lane exclusively for OFWs. The Department of Foreign Affairs (DFA) National Capital Region-Central, located at Robinson’s Galleria in Ortigas, has 400 slots for OFWs per day. But since it is just a 400 slots a day, you have to be there as early as 4:00 am or 5:00 am to get one. However, OFW passport applicants were also assured that they will be entertained at the satellite office following the said time schedule, even if mall hours start at 10:00 am. "OFWs with complete documents and arrive at the satellite office before 12:00 noon, can have their passport renewal processed on the same day." It added that OFW passport applicants were also assured that they will be entertained at the satellite office following the said time schedule, even if mall hours start at 10:00 am. However, this 2017, there are OFWs who disprove that claim that passport can be released within a day. It says that even if you are OFW, arrived very early and get in 400 slots allotted, your passport will be released, seven days the shortest. 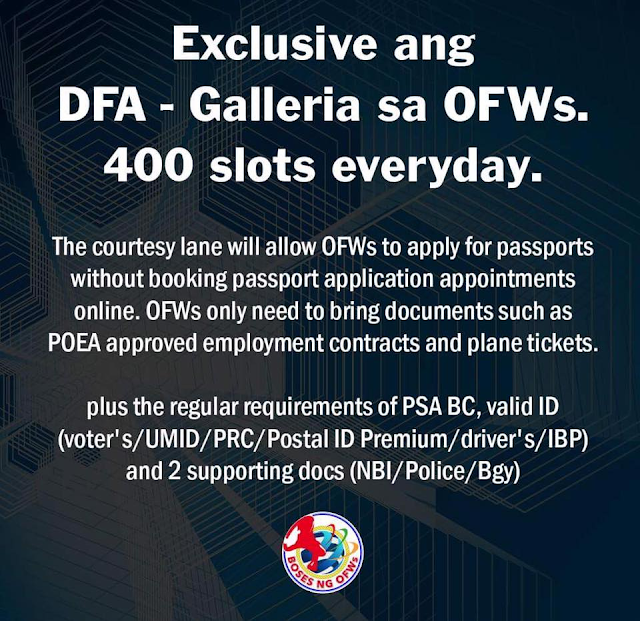 For further inquiries, OFW passport applicants may get in touch at the information counter of DFA NCR-Central or call (02) 631-0806 or email at dfa.ncr.central@gmail.com. 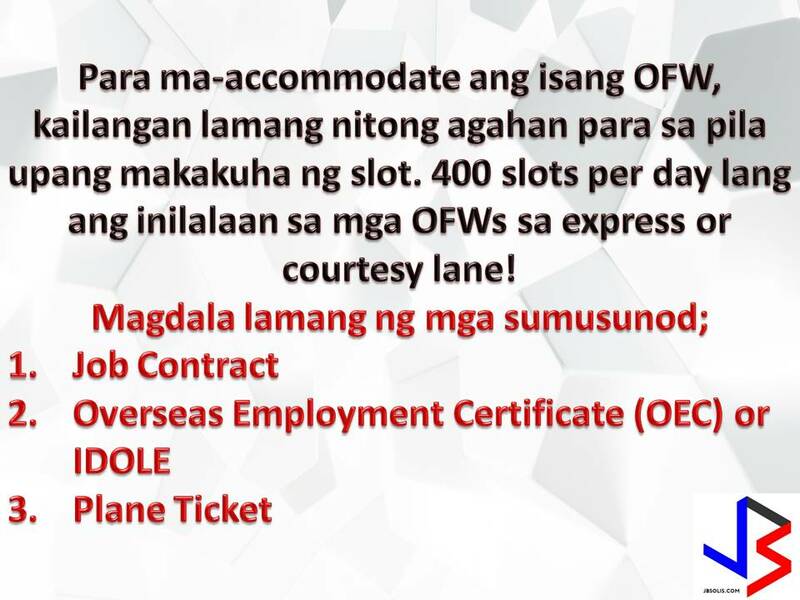 Also, there is an OFW Express Lane in every passport processing center of DFA but if you cannot see one in your area, you may approach any passport processing officer with your requirement need and explain to them that you are an OFW.